I came across the 2008 $1 note during Hari Raya Aidil Fitri (the Muslim festival to mark the end of the fasting month). During this month, many families give out money to the children who come visiting their houses. What I did not realise was that the 2008 is new as the ones before this was the 1996 and the 2007 series. It took an email from my friend Kai before I realised that I got the 2008 series. 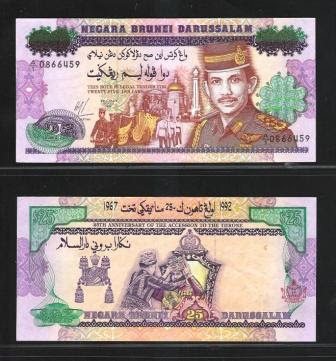 Anyway, here is the scan of the 2008 Brunei $1. 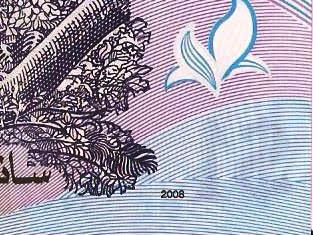 The note remained the same except with this 2008 printed at the obverse of the note. I bumped into one of my junior colleagues at MOF yesterday. I was there defending my ministry's budget request for the next financial year. He told me that he had something that I might be interested in. He showed me a $1,000 worth of $50 Singapore notes. I already had a few of these notes. I was quite surprised that he had 20 pieces of them. My colleague travelled frequently but even then I was surprised that he had managed to collect about 20 pieces of these notes. They are not rare but certainly you don't find them laying about. He asked me how much they are worth. Used notes are difficult to judge so I can't answer him. He said that someone offered to buy each note for $55. I thought that was a bit cheap but they are used. Anyway to cut a long story short I got a few of those notes. Who knows when I will see 20 of them again in the future. These Singapore notes I think were the first time that Singapore forayed into the polymer notes. It was certainly an experiment back in 1990 for them. 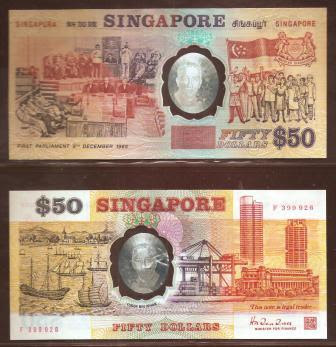 The notes were issued to commemorate Singapore's 25th Anniversary of their independence. Every now and then, good luck happens. My nephew, a branch manager with one of the banks in Brunei called me up and said that one customer deposited $185 worth of the above notes. He did not the value, all he said was, paper notes with white borders. That perked me up. 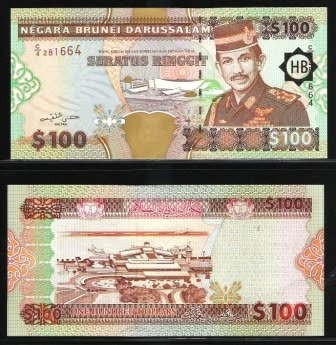 White borders means either the 1st series or 2nd series Brunei notes. Apparently the customer's father had been keeping this money under his bed or pillows or something like that. He was worried that the money might be lost and he had decided to deposit it into his dad's account. What a dutiful son. The amazing thing was that almost all of the notes were in AUNC condition (Almost Uncirculated which means looking very unused to people not in the numismatic jargon). Anyway, I rushed over and exchanged brand new notes for these old notes. I could not believe my luck in my collection this last two months. Last month, I got about $3,000 worth of 1990s paper notes. This month, not as much, but equally or more valuable, the 2nd series. How much is this worth if it was in the market? For a pure UNC, it might be worth ten times its face value. For each $5 notes first issued in 1981, if I am not mistaken, you probably, if you find a buyer, sell it for $50. Though this one is not as valuable. Issued in 1989, probably worth around 4 times its face value. Still it is a good 2nd series collection and I am glad for my good luck this Hari Raya. If someone was to ask me what is it that you want? There are many things that many of us want and I too have my own wants. But I am pretty much satisfied with the Al-Mighty's gifts. However philatelically, there is something I want the most. 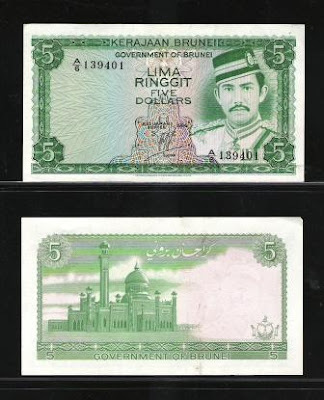 That one is this Brunei's stamp during the Japanese Occupation in the second World War. 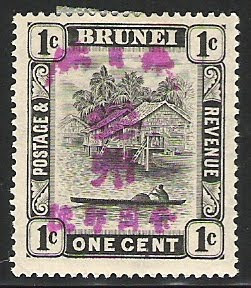 During the War, the Japanese overprinted Brunei's stamps with their Imperial Japanese mark and used these stamps. These stamps are all highly valued because not many were available due to the fact that not many people were sending out letters during the War - the Allied (British, Australians etc) were captured and who on earth were the then Brunei people want to write to? 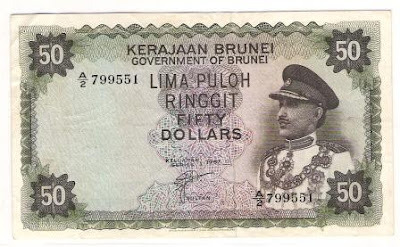 The most expensive of all the overprinted Brunei is this one. This 1 cent stamp overprinted for $3 payment for telegraphic use is valued at about $12,0000 to $15,000 today! Get hold of one and you can live quite happily to the end of days. However, I acquired this stamp recently. And most of you readers are thinking WoW! Unfortunately this is not the real McCoy. This is a fake and I paid pittance for it. Relatively speaking pittance but even fakes still cost a fair bit. If ever you find an original one hidden somewhere in your grandfatherh's stamp collection that looks almost like this or better than this and want to know who will pay good money for it, let me know. I can't offer $12,000 but let me know, we can work out a new price. The other day my sister called me up. She said they came across someone depositing paper notes. Every now and then I had been asking her whether paper notes have come in. This time I struck lucky. 8 of these notes came in and I was very lucky. Their condition was almost AUNC. You can't get any better than that. Anyway, I am posting the notes, so you can see for youself what they are. We will be celebrating the end of the fasting month soon. In Brunei, Malaysia and Singapore, the festival would be known as Hari Raya Eid Fitri. Most other countries would just say celebrating the Eid Fitr. Surprisingly, I don't ever remember seeing any stamps produced specifically for the celebrations by any of the Muslim countries. So, I was pleasantly surprised to receive these two sets of stamps from my good friend, Kai in Australia. He sent me these stamps which came from his own personal collection and hoped that these would come at the right time. Yes indeed Kai! 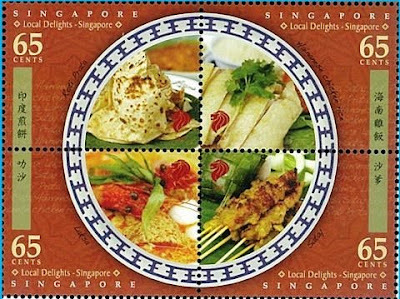 The stamps came in time for the Hari Raya celebrations. The first set is from Christmas Islands. I checked and found out that these stamps were issued in 1989. The second set is from Keeling or Cocos Islands and these were issued in 1991. This is the one coin that I will never get tired of. Everytime one of these babies come up on ebay, I buy it, well almost everytime. I have a price limit of around USD50 which is still a bid high compared to about B$45 which you can buy from the local dealers here. This coin was part of a million coin minted in Edinburgh. Someone convinced Sultan Hashim that he needed a new coin by suggesting that he pay for the minting and he will take half of the mints. The British was appalled when the coins came into the market. As soon as the British ran the government from 1906, the first act was to ban all these coins. Happy New Year 2008! I do hope you enjoyed last year's postings of stamps and currency notes. This year I hope to do more and blog more often about stamps and currency notes which I have collected as well as the news about some of these. Anyway, one of my wife's niece's husband was a pilot with RBA and I asked him when he will be flying out to London and to help me get those notes. Anyway he hasn't been flying to London lately but he had a 200 dirham in his wallet and I changed for that first. 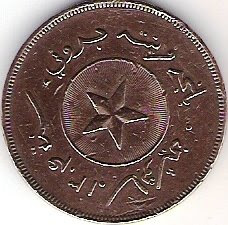 The 200 dirham was issued together with the 100 dirham in 2004. Here is the 200 dirham note for you to enjoy. I still want that 1,000 dirham note.